A mom traveling with her baby must pack and bring essentials that will help her enjoy the trip and avoid annoying and disastrous baby moments. Among the essentials is a nappy bag to keep diapering essentials within reach. Disposable changing pads, diaper creams, box of wipes and diapers should top your travel checklist of what to pack. If you’ll be on a road trip for a longer time, a travel potty is a must. You should never forget enough pieces of sealable plastic bags for diaper and all of these in addition to a nappy bag should always be near or within your reach. When traveling with a baby, there will always be a time to change the diaper. Airports and bus terminals usually have reserved area for diaper change. However, if changing the diaper needs to be done inside the car or bus, a nappy bag with disposable diapers is great to be at hand. Stopping at every gas station is eliminated thus allowing you to save some on gas, travel time and from annoying looks of fellow passengers and bus drivers. Since the baby is cleansed and timely changed, a quieter baby lets you enjoy the sights along the road. Having a baby bag also allows you to carry baby accessories that you may need to keep your baby clean, comfortable and safe from harsh environments while on the road. A bag that is big and spacious enough to carry miscellaneous items like soap, plastic bags for soiled diapers, nursing cover-ups and baby snacks as well serves the purpose well. Your baby needs are attended immediately and fast thus saving most of your energy and your cool. 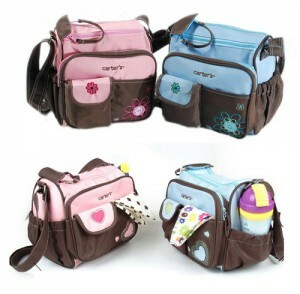 If you’re among those moms who like to travel in style even with a baby, designer baby bags allow you to be. You’ll be able to match your traveling apparels with these designer bags for babies and become a stylish mom that you are. While some are expensive, there are those that are cheaper but with same high quality materials and designs that can match any style. A designer baby bag can also serve as a good alternative for a designer tote bag and at the same time having the must-haves for your baby while keeping up with your style. A mom traveling with her baby as a primary concern is keeping the baby comfortable and safe while on the road. A sturdy and dependable baby bag to pack all the essentials in keeping the baby clean and comfortable serves the purpose well. It is something that a mom traveling with a baby shouldn’t be missed.